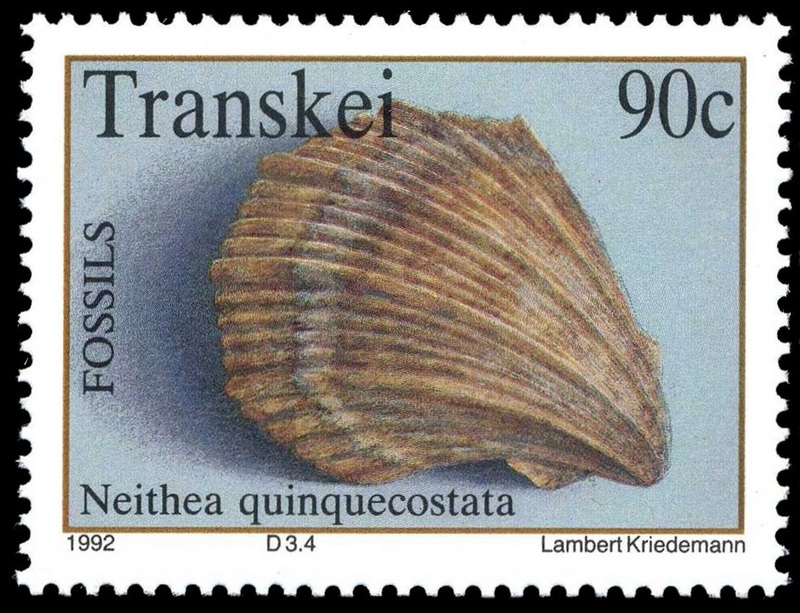 Transkei 1992 "Fossils: 2nd set of the series"
The stretch of beach between the site of the Wild Coast casino and the estuary of the Mzamba River in Transkei is locally known as the Fossil Forest. 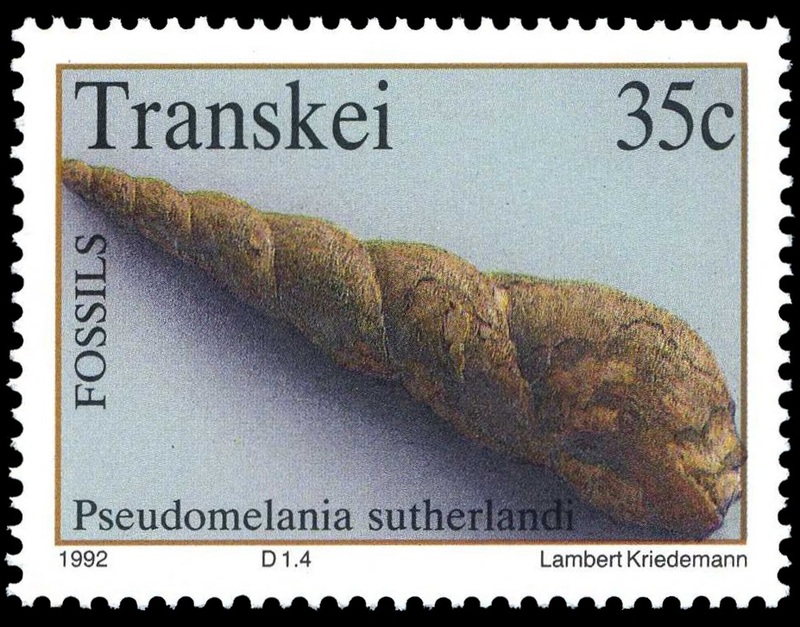 However, this name is a misnomer, for the large petrified tree trunks exposed on the beach at low tide are all orientated horizontally, lack roots and are embedded in rocks which contain a wide variety of marine fossils. 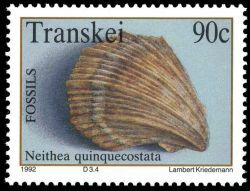 This indicates an ancient marine environment in which the logs had washed up on the beach or became waterlogged. Low cliffs on either side of the Mzamba River estuary comprise alternating hard and soft sediments and continue the section exposed on the beach. 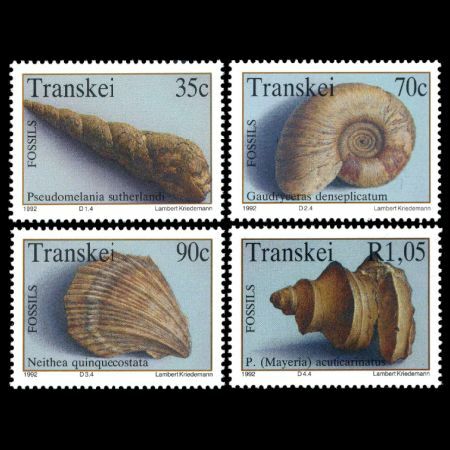 These contain numerous shelly marine fossils which belong to the Santonian and Campanian Stages of the Cretaceous System of about 75 to 85 million years ago. 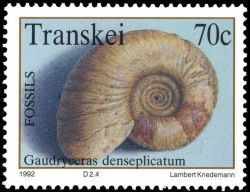 These rocks and some of the fossils were first described in 1855 in the Ouanerly Journal of the Geological Society of London by Captain RJ Garden and WH Baily respectively. 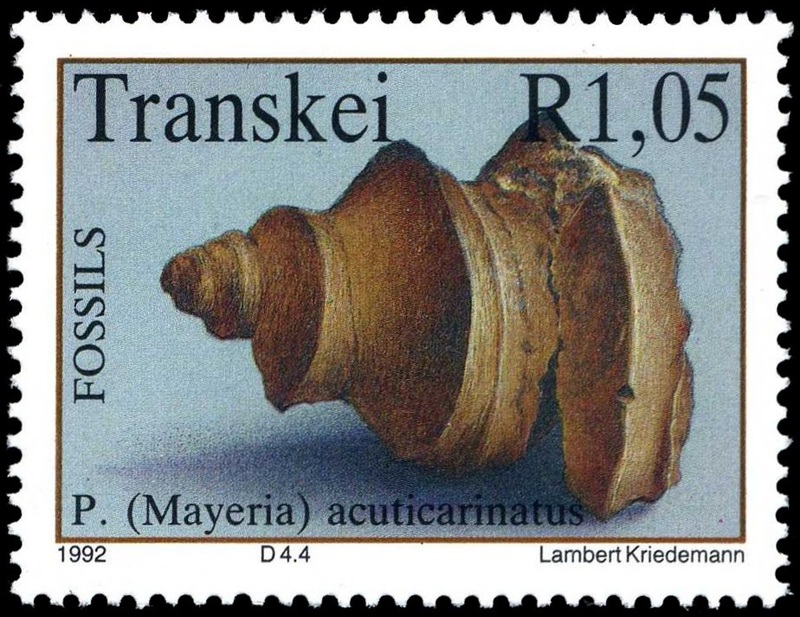 The fossils depicted on the stamps and the commemorative envelope are from the Mzamba Formation, as these rocks are now collectively referred to scientifically. 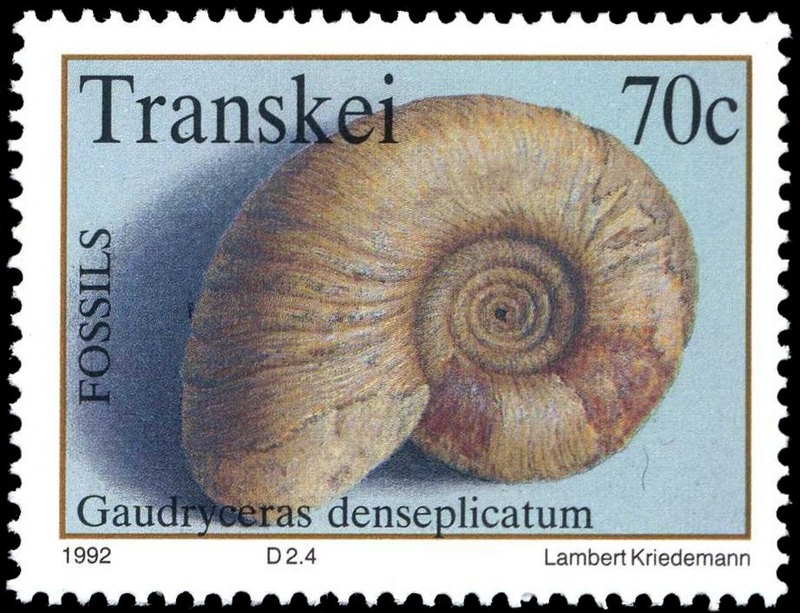 They include forms which are now totally extinct, namely the ammonites, as well as others which have extant representatives, such as gastropods and bivalves. 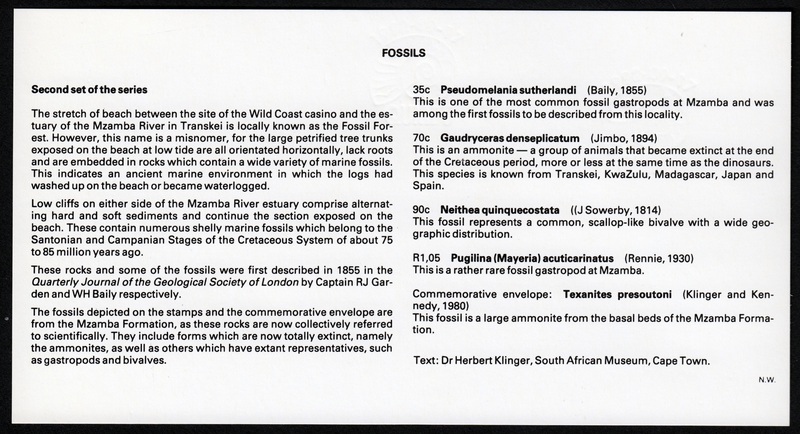 This is one of the most common fossil gastropods at Mzamba and was among the first fossils to be described from this locality. This is an ammonite a group of animals that became extinct at the end of the Cretaceous period, more or less at the same time as the dinosaurs. 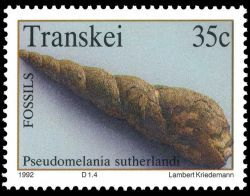 This species is known from Transkei, KwaZulu, Madagascar, Japan and Spain. 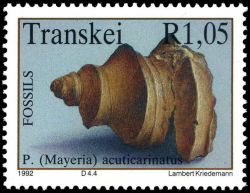 This is a rather rare fossil gastropod at Mzamba. 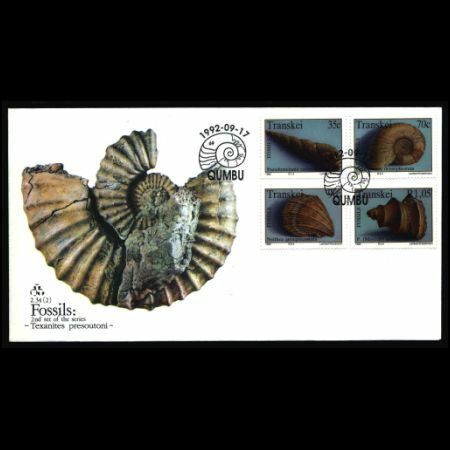 Commemorative envelope: Texanites presoutoni (Klinger and Kennedy, 1980) This fossil is a large ammonite from the basal beds of the Mzamba Formation. 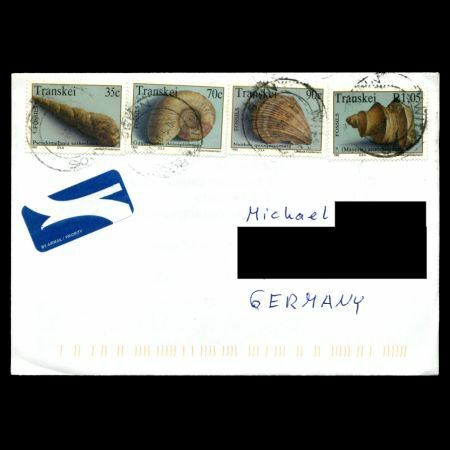 Text: Dr Herbert Klinger, South African Museum, Cape Town.